We are still learning to develop distinctively Australian farming systems, the head of the nation’s international agricultural research agency says, but we’re making progress. Andrew Campbell, chief of the Australian Centre for International Agricultural Research (ACIAR), told this week’s Restore, Regenerate, Revegetate conference at the University of New England (UNE) that Australian agriculture has a lot to be proud of — and a lot more to achieve. 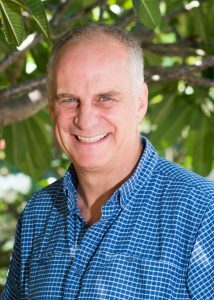 Andrew Campbell, Chief Executive Officer, Australian Centre for International Agricultural Research. Prof. Campbell, who was Australia’s first National Landcare Facilitator in the early 1990s and managed the pioneering Potter Farmland Plan project in the 1980s, mused on the changes that have occurred in environmental restoration over the last four decades. “I would guess that many districts look in far better health today,” he said. He explained this challenge to nearly 300 people who travelled to UNE to discuss the past 40 years of ecological restoration work in Australia. Prof. Campbell has been working in agriculture long enough to understand that Australian agriculture represents a major achievement. Along with old, depleted soils and comparatively little surface water, Australian farmers contend with one of the world’s most variable climates. And yet, Prof. Campbell told the UNE conference, true sustainability is still some way off. His view is that the answer lies somewhere in the direction of what has been called “sustainable intensification”. The problem with sustainable intensification, Prof. Campbell acknowledged, “is that too often, it’s easy to spot the intensification, but not so easy to spot the sustainable bit”. Setting aside land to provide environmental services has multiple challenges, but the first and primary hurdle is: who pays? He reflected that getting appropriate policy settings in place, and aligning them with the technological and cultural changes necessary to produce a truly sustainable landscape over decades and centuries to come, is going to be an ongoing challenge. Australia isn’t alone in this. Prof. Campbell said that many other countries in the Indo-Pacific region are facing similar challenges.